The magic question with this quilt was 'how to quilt it?" My client and i had many conversations and changed our mind a few times over this one. We finally settled on black thread and stitch in the ditch. Once i started it i wasn't happy with the 'in the ditch' so picked it out and stitched on the black and that was much better. 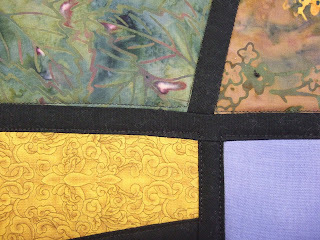 You can see the stitches in the closeup photo, the top two colors are the 'in the ditch' stitching and the bottom two are stitched on the black. 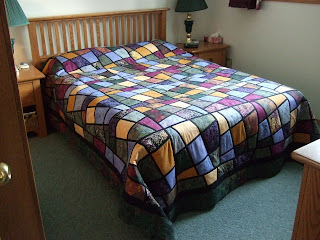 I love how this quilts looks on my bed too!